(January 2017). Art by David Finch. The Batmobile /ˈbætməˌbiːl/ is the fictional car driven by the superhero Batman in American comic books published by DC Comics. The Batmobile first appeared in Detective Comics #27 (May, 1939), where it was depicted as an ordinary-looking, red car. Housed in the Batcave, which the Batmobile accesses through a hidden entrance, the heavily armored, weaponized vehicle is used by Batman in his campaign to fight crime. The look of the Batmobile has varied over time, but since its earliest appearances, the Batmobile has had a prominent bat motif, typically including distinctive wing-shaped tailfins. Armored in the early stages of Batman’s career, it has been customized over time and is the most technologically advanced crime-fighting asset within Batman’s arsenal. Depictions of the vehicle have evolved along with the character, with each incarnation reflecting evolving car technologies. It has been portrayed as having many uses, such as vehicular pursuit, prisoner transportation, anti-tank warfare, riot control, and as a mobile crime lab. In some depictions, the Batmobile is able to be driven unmanned or can be remotely operated. It has appeared in every Batman iteration—from comic books and television to films and video games—and has since become part of popular culture. The Batmobile’s early design in Batman #5 (March 1941). Art by Bob Kane and Jerry Robinson. Batman is shown driving a red-colored car in Detective Comics #27, the first Batman story. However, this car was never mentioned by name as the Batmobile, and the concept of a red car was abandoned in subsequent stories. Although the Batplanewas introduced in Detective Comics #31, the name “Batmobile” was not applied to Batman’s automobile until Detective Comics#48 (February 1941). The car’s design gradually evolved in early Batman stories. It became a “specially built high-powered auto” by Detective Comics #30, and in Batman #5 (March 1941), it featured a bat hood ornament and a darker exterior color. Eventually, the predominant designs included a large, dark-colored body and bat-like accessories, including large tailfins scalloped to resemble a bat’s wings. Other bat-vehicles soon followed, including the Batcycle, Batboat, and Robin’s Redbird. Batman #5 (March 1941) introduced a long, powerful, streamlined Batmobile with a tall scalloped fin and an intimidating bat head on the front. Three pages after it was introduced, it was forced off a cliff by the Joker to crash in the ravine below. However, an identical Batmobile appeared in the next story in the same issue. The live action television series was so popular that its campy humor and its Batmobile (a superficially modified concept car, the decade-old Lincoln Futura, owned by George Barris whose shop did the work) were quickly introduced into the Batman comic books. But the high camp and general silliness of the television show did not sit well with long-time Batman comic book fans. So, when the series was canceled in 1968, the comic books reacted by becoming darker and more serious, including having Batman abandon that Batmobile. Its replacement for a number of years was a much simpler model with a stylized bat’s head silhouette decal on the hood being the only decoration of note. The 1960s TV style Batmobile still appears from time to time in the comic books, most recently in Detective Comics #850 and the issues of Batman Confidential. 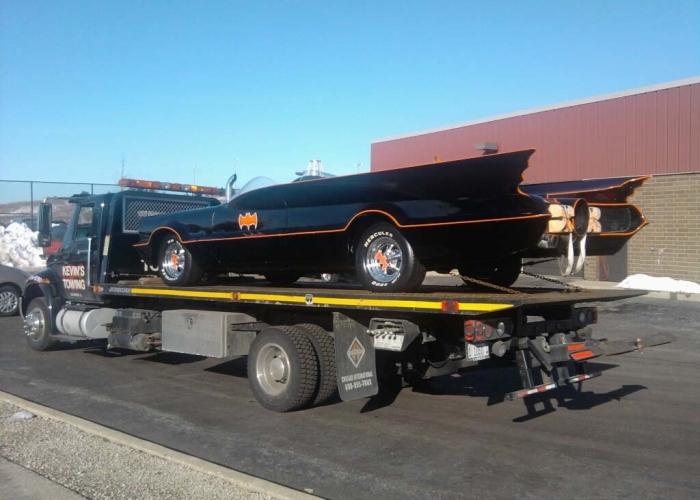 In the Bronze Age of Comic Books, the source of the cars was explained in The Untold Legend of the Batman as the work of stunt driver Jack Edison who volunteered to personally construct Batmobiles for Batman after being rescued from a burning wreck. In mid-1985, a special variation of the Super Powers toyline Batmobile appeared in both Batman and Detective Comics. This design had a full set of front and rear canopies, “Coke-bottle” sides, integrated fins, and generally rounder features, just like the toy. The only difference between this car and its toy counterpart is the nose, which was occasionally drawn to appear longer and more pointed. Beginning in the 1990s, the number of comics featuring Batman mushroomed with spin-off titles, limited series, and graphic novels. At the same time, there was considerable experimentation with styles of illustration. With different illustration styles in so many different books, there was naturally a corresponding diversity of designs for the Batmobile. This has continued with designs for the Batmobile ranging from conservative and practical to highly stylized to outlandish. 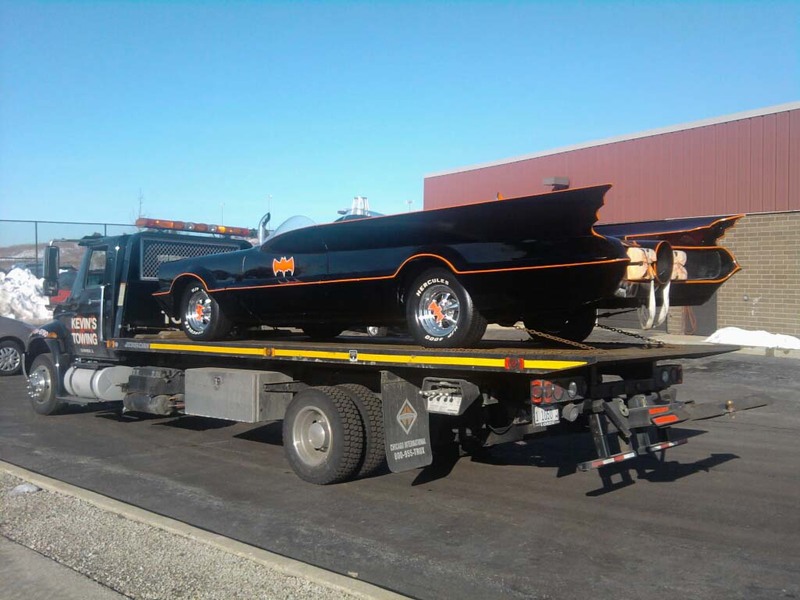 During the “Cataclysm” storyline, it is revealed that Batman has hidden a number of spare vehicles across the city just in case. A Humvee serves as a primary mean of transportation to cross the earthquake-ravaged city during the Aftershock storyline, as most of the Batmobiles are wrecked by the quake. These vehicles are not as sophisticated as the Batmobiles, but some of them are armored to withstand weaponry mounted on military automobile prototypes. The New 52 Batmobile in Batmanvol. 2 #14 (Jan. 2013). Art by Greg Capullo. In the “Batman: Hush” storyline, a double-page spread by Jim Lee shows various Batmobiles (from comics, movies, and all TV series) in storage in the Batcave. In addition, some incarnations of the character, such as Batman: The Animated Series, establish that Batman has a large ground vehicle fleet of various makes and models as well as utility vehicles to use when the Batmobile would be too conspicuous. In issue 9 of the third volume of Teen Titans, Robin and his friends use a Batmobile that he shipped out to San Francisco, hiding the expense “in the Batarang budget”. The 2008 book Batmobile Owner’s Manual, gives theoretical specifications of the car as if it were a real car. The book states that the Batmobile’s five cylinder engine is more powerful than turbine jet engines, and capable of achieving up to 10,000 horsepower (7,500 kW). In the 2009 series Batman and Robin, a new Batmobile is unveiled. This model is capable of flight, although is not as maneuverable as the Batwing. It can fire 19 types of projectiles, one of which is a flame retardant non-toxic foam, and features a concussive sonic blast device. This Batmobile was designed and constructed by Bruce Wayne. However, its construction was the source of great frustration to him, as mentioned by Alfred. In Batman and Robin #1 it is revealed that Bruce’s son, Damian Wayne, solved the problem of its inability to fly. The revised Batmobile in Batmanvol. 3, #42 (May 2017). Art by Mikel Janín. The Batmobile was redesigned in 2011 when DC Comics relaunched its entire line of comic books, with the Batmobile being given new aesthetics. In 2016, DC Comics relaunched its comic books once again in DC Rebirth. While many different models of the Batmobile are seen to be kept within the Batcave, the model that is primarily used is a revised version with a square design and armored appearance. However, this is not always the case, such as in Batman (vol. 3) #4 and #5. In the future neo-Gotham, a sleek, flying car version of the Batmobile is primarily used instead.